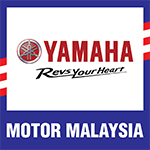 After a lackluster start in Saturday’s qualifying, Yamaha PETRONAS Super Series rider, Mohd Haziq Mohd Fairues came home a winner when the young gun succeeded the second round of the 2015 PETRONAS AAM Malaysian Cub Prix Championship, here in Batu Kawan, Penang. Having to start from the second row, the win was still a far reach especially when Shafeez Abdullah managed a holeshot but faltered after Haziq came up from behind to take the lead. Shafeez then tried to put a pressure on the leader but failed as Haziq gradually tightened his lines and stretched the gap. The misery did not end there for Shafeez when Mohd Azri Haris Abdul Fattah came up and took second spot, defending it until the end while Shafeeq lagged further behind. Haziq timed his race in 10:37.493s ahead of Azri Haris in 10:46.219s while Mohd Shahfiq Shahrun Nizam (10:55.224s) came in third. A straight win since Temerloh, Haziq now targets a third win in Muar with 50 points overall ahead of Azri Haris (40 points) and Imran Hadi Mohd Ismawi (24 points).